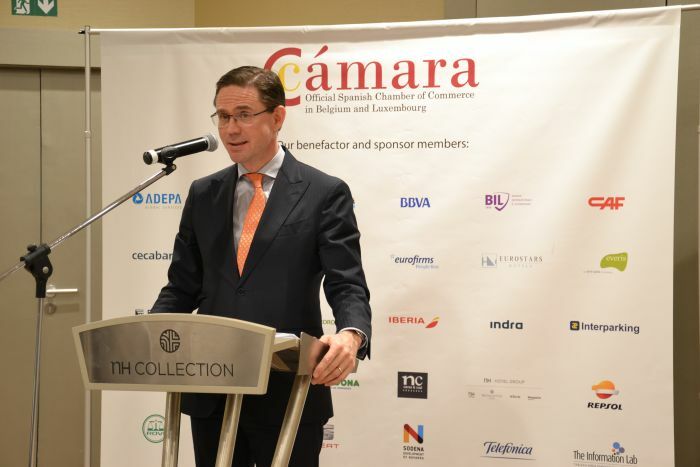 On March 7, the Official Spanish Chamber of Commerce in Belgium and Luxembourg organized a luncheon-debate hosting Jyrki Katainen, Vice-President of the European Commission for Jobs, Growth, Investment and Competitiveness about “The future of Europe”. 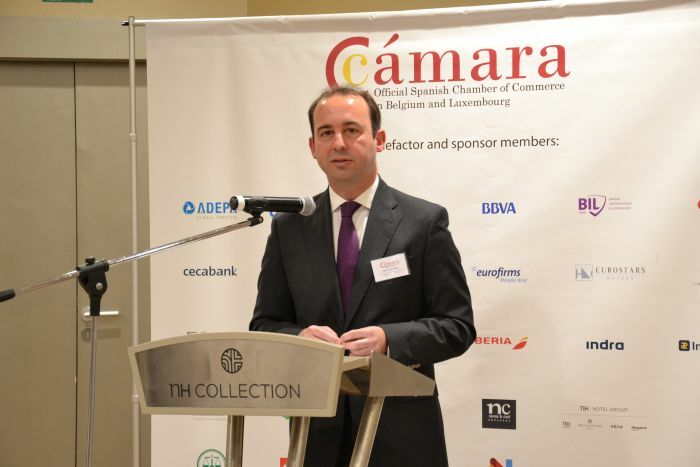 The event had the participation of CEOs of international companies, members of the Chamber and representatives of Spanish and European public bodies. The presentation was given by Pablo López Álvarez, Vice-President of the Chamber, who reviewed the professional career of Jyrki Katainen and expressed the satisfaction that it is for the Chamber to organize this type of luncheon with guests of recognized prestige such as the Commissioner. Hereafter Katainen took the floor, from the beginning he transmitted a motivational and of change message with his speech. The Vice President proposed three main areas to expose the future situation of Europe. The first one refers to a more integrated European Union: member countries, businesses and European citizens will make a more united Europe in a few years. Regulatory measures, many of which have already been or are being implemented, will give way to a Europe with new markets that will create new business opportunities such as in the plastics industry and its future transformation. As a second area, he referred to the challenges coming from outside the European Union, where he highlighted three key powers: the United States and its conception of the market that is far from the open market vision of the EU; China, and the problems linked to the non-opening of its market to European investment, and finally, Russia. In line with the external relations of the EU, Katainen invited attendees to reflect on whether we are strong enough to act in defense of the EU. In the third and final field concerning the future of Europe, the internal challenges faced by the EU itself and the crises associated with the fundamental values ​​of the European project were highlighted. Jyrki Katainen ended his speech by referring to the role played by Spain in the EU, considering it a good ally as a European partner. The Vice President expressed his wish that Spain take a step forward in fundamental aspects such as the national market integration, the single internal market or development. He highlighted the history of the country in terms of the struggle for its internal security, and the prominent role that Spain could have in leading the debate on the defense of the EU. To conclude, Katainen stressed the common goal that must be worked towards the future: to achieve a more competitive and integrated Europe. After the presentation, a round of questions began where participants could raise their different concerns about the future of Europe. During the debate, topics such as the single internal market, circular economy, Artificial Intelligence, defense and security of the EU were discussed. From the Chamber we want to show our gratitude to Bodegas Abadal, whose wines could be tasted by all attendees, and to participants for this successful luncheon-debate.